Jury Nullification: A Treatise on Law, Constitutions and Democracy. In the meantime, please visit this page on a desktop computer. "The d’Oudney analysis is as insightful as it is comprehensive. It will stand for years to come as the definitive critique of the European Constitution prepared by Giscard d’Estaing and others. I look forward to sharing the d’Oudney analysis with my colleagues." HOWARD PHILLIPS, Founder, The U.S. Constitution Party, three-time Presidential nominee; Chairman of the Conservative Caucus. "I read it with great interest. It is absolutely excellent." "This book is brimming with insights presented with clarity and drive. Kenn d’Oudney’s book should be read by every person who cares about the right of people to justice and liberty." British Weights and Measures Association. "You have an excellent book. I think every person in the world, especially Americans, should have your book." ALLAN HAMPTON, Free State Project, Arkansas. "It is a fascinating and important work. Watching with dismay the attacks on our freedom through ignorance of our constitution, I thought I had heard all the major arguments. This book was an eye-opener even to a well-read student of this subject and I can heartily recommend it." If you are an American, Canadian, Australian, Chinese, Russian or African, what, you might ask, does the European Constitution have to do with me? The answer is that to understand whether one’s own constitution is as protective of your inherent citizen’s legal rights as it should be, it is helpful to compare it with others. 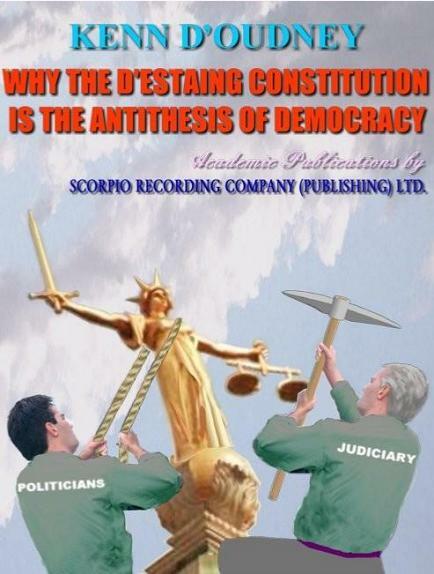 This book shows the difference between the phoney, illegal antidemocratic ‘constitution’ which installs despotism (absolute government control over the people), and the real constitution which will establish Justice, Liberty, Rights and Democracy if it installs particular definitive tenets, and these are strictly upheld. Constitutions can only be maintained by an active mass of the common people strictly monitoring, maintaining and protectively enforcing their constitution, the populace needing always to be educated to the fact that governments (i.e. the executive, the politicians and the judiciary) at all times and in all places trend towards despotism. The pernicious calumny that England (or Britain) has "no constitution," is promulgated today by individuals of parliament and judiciary, to obscure their routine violation of the 35 times ratified Constitution. From this vile seed despotism is now visibly extant and growing. The old Soviet and the new European Union ‘constitutions’ are perfidious antidemocratic ‘Munich guarantees’ which exemplify constitutional despotism. These ‘constitutions’ embody gross institutional tyranny. As documents they profess to acknowledge people’s ‘rights’, but altogether deny the only (peaceful) means and rights known to mankind by which tyranny is surely circumvented: the citizens’ rights and duties in Trial by Jury, including that of judging the justice of the law in finding a verdict. Without the Trial by Jury empowerment of citizens judging for themselves and nullifying what ordinary people deem to be illegal unjust acts of government, people cannot but be slaves to the whim of politicians and judges who retain all power to decide the law and run roughshod over the people. Consider this subject as of the utmost gravitas, one between freedom and slavery; life and death. It is not solely one of academic study and semasiology. We have all lost family and close ones to the wars and ravages of despots. Let us strive hard for Restoration and Universal Adoption of Constitutional Common Law Trial by Jury… because Democracy and Trial by Jury together inseparable as one, form the unique political and constitutional system of peace, progress and human salvation. Democracy installs the rôle of Juror as the citizen's most important secular adult duty. Democratic Trial by Jury alone proffers the preservation of individuals without prejudice in regard to their race, gender, religion and background. In Trial by Jury, democracy intentionally recognises that all men and women are created equal. Trial by Jury renders to every adult the responsibility and status of equal and judge. This contributes to the creation of an ethos of civility, mutual respect, liberty, egality and fraternity. "Constitutional adoption and practical implementation of the Citizen-Juror's Duty in Trial by Jury, to judge the justice of every act of law enforcement, define, and comprise the basis of, Democracy, sine qua non." See paragraphs quoted from The Constitution Treatise. They explain and define democracy. 1. "Only as long as juries of ordinary citizens have the final say, government remains the servant, not the master, of the people." 2. "Suffrage does not define democracy, for electoral voting takes place in totalitarian states. Having been elected, there is nothing to stop government from imposing control of an upper house, reneging on pledges, nor from adopting any tyrannical measures it chooses." 3. "Constitutional adoption and practical implementation of the Citizen-Juror's Duty in Trial by Jury, to judge the justice of every act of law enforcement, define and comprise the basis of, Democracy, sine qua non." 4. "In practice and by definition, government which denies its ordinary citizens the right to judge the justice of the laws and the manner of their enforcement on their fellow citizens at trial, is a despotism." 5. "Constitutions which deny the Common Law Trial by Jury Justice System install constitutional despotism." "For centuries since 1215, the English people revered and called Magna Carta "the Palladium* of the People's Liberties." The Juror's Duty to judge the justice of law enforcement in Trial by Jury was the foundation of the People's sincere belief that all Britons never would be slaves; and that the United Kingdom, the United States, and the numerous post-colonial nations which constitutionally adopted the Common Law Trial by Jury Justice System, are democracies." *"NOTE. Definition, Palladium: any safeguard; a symbol, metaphorical or statuary, which represents the protection of the liberties and rights of man. Derived from Pallas Athene, Hellenic Greek goddess of wisdom and war. Today, the world's most famous Palladia are the Trial by Jury, and The Statue of Liberty in New York harbour." "With Trial by Jury holding sway, the People are served, not ruled, by governments, whose laws count for naught unless they be just. Such government cannot but embody civilised ideals and aspirations. Because no tyrant can attain power, this government only attracts and is comprised of truly democratic representatives. At the behest of juries of ordinary citizens, the state is constrained into enforcing only just democratic principles which accord with the People's judgement, such as those represented by common law: fraternity, liberty, egalitarianism, progress and justice." The Author's related works are endorsed by a Nobel laureate professor emeritus Official Adviser to U.S. government; a Professor of Physiology Fellow of the Royal Society, by eminent authors, academics, doctors of jurisprudence, medicine, psychiatry, homeopathy, and by ecologists and judges (U.S. and U.K.). This Treatise is an inspiring erudite work of incontrovertible argument, with quotations in support by U.S. presidents, U.K. prime ministers, chief justices, judges, learned authors and lawyers. The book presents the subject from a heretofore entirely unconsidered standpoint. The knowledge it contains empowers citizens with constitutional facts recondite even to the legal profession. The exemplary U.S. and U.K. constitutional laws are the standard by which any proposed new legislation is measured. This book exposes the deceit by which d'Estaing and committee (who claim to protect rights and democracy) duplicitously word a 'constitution' which actually installs the identical Stalinist and fascist method of population-control, to form the statist régime of the new Europe. The Legal Criteria of Constitutional Democracy. A nation state governs by its Justice System. The power to punish carries with it ALL power. If at any time, albeit for an instant, the Supreme Power is removed from or ceded by the people, and the power is acquired by, or delegated to, a group consisting of LESS than all the People, then the democratic state has ceased to exist: an undemocratic government, that is, a despotism, has assumed its place. It was explicitly to counteract arbitrary (i.e. corrupt; tyrannical) government that the protections of Magna Carta installed the people's "law of the land" criteria of constitutional democracy "in perpetuity" and "for ever." See Preamble & Article 63. These criteria, which were also constitutionally adopted by the U.S. Founding Fathers, have been the foundation of compassionate democratic civilisation through the tribulations of a long varied history. As has repeatedly occurred in the past, instead of upholding them, present-day criminal 'politicians' now intend their destruction. See DEMOCRACY DEFINED ISBN 9781902848266. (v) equality before the law. Many Europeans have lost all memory of democracy and their Gothic heritage of Common Law Trial by Jury. They were deceived by their unscrupulous politicians who praised the numerous social benefits listed in the so-called 'European Constitution', without sufficiently alerting them to the fact that all the terms of the 'constitution' are not guaranteed; they do not control and bind the governing bodies in the slightest. Some 'constitution'! On the contrary, the terms are actually changeable at any time at the whim of the unelected commissioners (commissars) of the Supreme Soviet (council) System: citizens are utterly at the mercy of the inquisitorial methods of trial-by-judge, which denies habeas corpus (freedom from arbitrary detention); freedom from arbitrary arrest (without probable cause); and Trial by Jury. Ipso facto, the 'European Treaty-Constitution'* is NOT a constitution; it is literally a charter of mass enslavement to the power of, or behind, the state. *Definition-in-brief: a constitution is a binding code for the guidance and control of government, changeable only by the active participation of the great mass of the people. The Spanish decision, for example, overruled a significant proportion of the population, which, when added to the large number who did not vote (to adopt it), was the real majority. Thus was the execrable result of government-by-referendum. The common law is "the law of the land," legem terræ, the People's fundamental code and law of which Trial by Jury is the central tenet and sole justice system, as inscribed into the Magna Carta of 1215. See chapter [i.e. article] 39. Common law does not include any statutes made by government nor decisions made by judges. See DEMOCRACY DEFINED ISBN 9781902848266. The common law which existed in 1215 A.D., at the time of the Great Charter Constitution's (Magna Carta's) first of many enactments and ratifications, must be differentiated from that which modern government has corrupted by legislation: a counterfeit which is "common law" in name only. Common law is emphatically neither "government-made" nor "judge-made." Quite the contrary: it is exclusively the product of the sense of fairness, natural law and justice of the ordinary people. Modern usurpation notwithstanding, genuine common law does not consist of case precedents (stare decisis), for juries decide the law, which includes the sentence, in each individual case. Nor is it comprised of judicial rulings, decisions or interpretations of statutes. Common law does not ever or in any way come from government judges. Indeed, common law is the antithesis (the 'opposite') of judge-made law, and it is supposed to free all the people equally from the shackles of arbitrary government and their bidden employees. This common law, inserted into the Constitution, binds government and legally controls the government's modus operandi. Common law is the basis of democracy, sine qua non. The constitutional information contained in this work is essential to the protection, well-being and happiness of citizens. This Treatise is that rare phenomenon: a book on law which is gripping and stimulating for the everyday reader. After perusing this book, readers are enabled to perceive the ignorance or degenerate motivations of every person who advocates measures which erode the U.S. or U.K. constitutions. Publisher: SCORPIO RECORDING COMPANY (PUBLISHING) LTD.